Challenger Bermane Stiverne makes a remarkable threat to WBC heavyweight champion Deontay Wilder in New York. Over two years on since surrendering his WBC heavyweight title to Deontay Wilder, Bermane Stiverne finds himself back in the ring with him once again this weekend. It’s an opportunity that has come out of nowhere due to Wilder’s previous opponent failing a drugs test which gave Stiverne the last minute shot to step into the breach. Whether or not he’s been given enough time to get in shape for a fight of this level will remain to be seen. The weigh-ins later on today could give a good indication however. 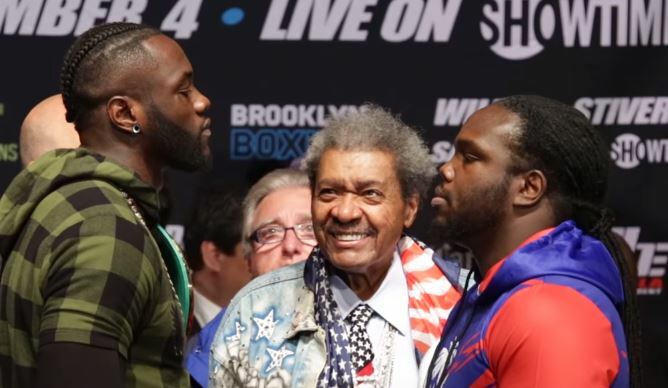 Having said that, this is heavyweight boxing after all and Stiverne will know that if he lands a big one early on – that it may just be enough to spring an upset. “He said that he fears for my life. Do you fear for my life? I don’t fear for your life because I’m a killer. If that’s what it takes to take that title – that’s what I’m going to do – because I’m going to walk away with a smile on my face. The fight will take place Saturday night at the Barclays Center in Brooklyn, New York.